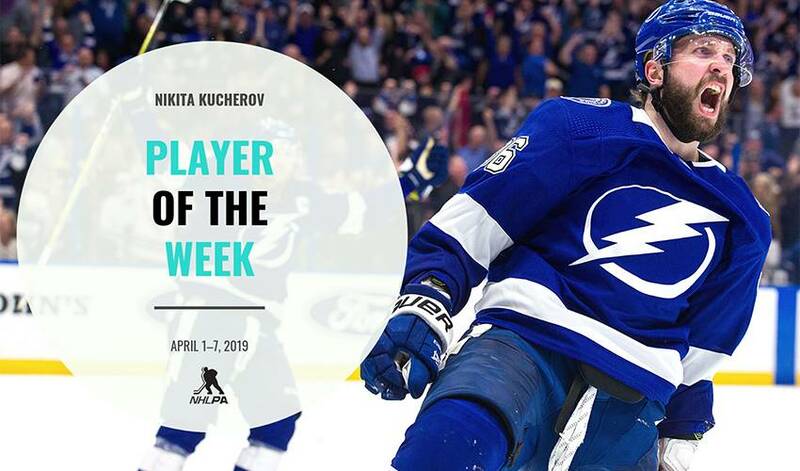 He's the undeniable front-runner for the 2018-19 Hart Memorial Trophy, and after leading the race continuously since December 28, Nikita Kucherov has locked up the Art Ross Trophy race to finish his regular-season campaign with 128 points and career-high scoring totals (41-87–128). Kucherov became the second Tampa Bay Lightning player in franchise history to earn the annual award, given to the NHL player who leads the league in points at the end of the regular season, and joins Martin St. Louis. His league-leading 128th point, scored Saturday night, had extra significance as he set a new single-season scoring record for the most by a Russian-born player. Monday, Kucherov extended his league-leading point total to 125 with a trio of assists in a 5-2 win for Lightning over the Ottawa Senators at Canadian Tire Centre. The mark brought the 25-year-old within two points of tying Alexander Mogliny's single-season record for most points scored by a Russian-born player. Kucherov was named the game's second star, behind Yanni Gourde's two-goal night, as the Lightning became the third team in NHL history to reach the 60-win mark. Lightning head coach Jon Cooper credited Kucherov's typical play and his linemates for a solid team effort. "They were really good tonight. "[Brayden] Point had the puck on his stick all night long, [Kucherov] was just being [Kucherov], finding everybody all over the place, and [Gourde] was going to the net, doing what he does. They were kind of the engine that got us going, definitely in the second period." Tampa Bay finished off the second half of a back-to-back the next night in Montreal with a 4-2 loss to the Canadiens. Kucherov was held off the board but led game forwards in ice time with 22:26. Kucherov picked up his 40th goal of the season Thursday night at Scotiabank Arena in a 3-1 win for the Lightning over the Toronto Maple Leafs. The empty-netter matched the forward's career-high in goals, set in 2016-17 as part of 85 points. The goal also helped Tampa Bay become the 23rd team in NHL history to boast three 40-goal scorers. Saturday marked the final day of regular-season action across the league, and the Lightning used it to tie an NHL record for wins in a season with their 62nd by ways of a 6-3 victory over the Boston Bruins at TD Garden. Kucherov posted a multi-point night, including his eighth game-winning goal of the season, to earn his coveted 128th point for the single-season scoring record by a Russian-born player. In typical hockey-player fashion, "Kuch" kept it humble while acknowledging his teammates' help in reaching the mark. "It's definitely a special moment," Kucherov said postgame. "Thanks to all the guys in the room for helping me out, I wouldn't be where I am now. It's a team effort." Kucherov also posted his 87th assist, tying the record for the most in a single-season by a winger (previously set by Jaromir Jagr in 1995-96). After finishing regular-season play on the road, the Presidents' Trophy-winning Lightning head back to Amalie Arena for the comforts of home-ice advantage for Game 1 of the Eastern Conference First Round Wednesday night against the Columbus Blue Jackets (7:00 p.m. ET).